One would assume that the Alddreu Airfield, built by the Japanese during their occupation of Jeju, would now be a large vacant plot where birds flock and the wind blows through the tall grass. This was not the case on the overcast Sunday I visited. It was a large plot of land with plenty of birds, and the wind was blowing, through not only the blades of grass but also the wings of airplanes as they took off from the yellow sod. Helicopters soared past an old metal pole that once held a windsock and a biplane was being refueled as a toddler stood over it, looking as if he wanted to rip the pilot from his seat. Currently abandoned, the Alddreu Airfield has an ineffective warning attached to its gated entrance that reads, “Do not enter. Emergency use by the Korean Air Force only.” This had not deterred the 10 or so model airplane enthusiasts that, at least on that day, re-appropriated the airfield to enjoy their hobby. Though now almost parodied by the hobbyists, the airstrip’s original intention was of a far more gruesome nature. Park Chan Sik, former head of the 4.3 Research Institute, said that “the Japanese started building the Alddreu Airfield in 1931 in preparation to attack China.” It was completed in 1935 and measured almost 600,000 square meters. The airfield was expanded during the war between Japan and China in 1937 and then again in 1944 to 2.6 million square meters before Japan surrendered to America. The alddreu plain was considered ideal for a landing strip because of the flatness of the area, especially when compared to the rest of Jeju Island. The airfield is massive but there is not much to see as it is basically only a field, but surrounding it are remnants of old, concrete structures. To the northeast of the field is a rounded structure that rises out of the ground. A nearby placard states, in English and Korean, that it is a bunker built in 1945 as “an annex to [the] airfield for the Japanese navy.” It was constructed out of concrete then volcanic rock and shrubs were used to hide the building. 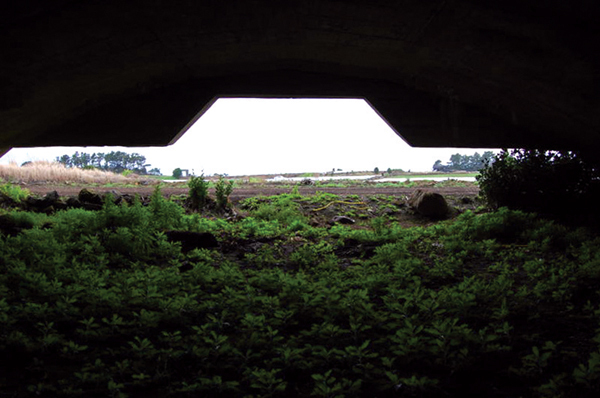 According to a Jeju provincial government document prepared for UNESCO, the bunker is still in its original condition. Inside are several eerie rooms lit by motion sensors that cast shadows against the walls and make dark corners seem even more ominous. Near the airfield remain 19 of the 20 airplane hangars that “were built to protect the Japanese suicide-bombers, so called ‘kamikaze pilots, from air raids,” the government document reads. The hangars are also rounded and camouflaged by the tall grass that still grows on top of them today. As with the airfield, the hangars have been taken over by local residents. The surrounding area is currently farmland and the deep, concave hangars are used by the farmers as sheds. 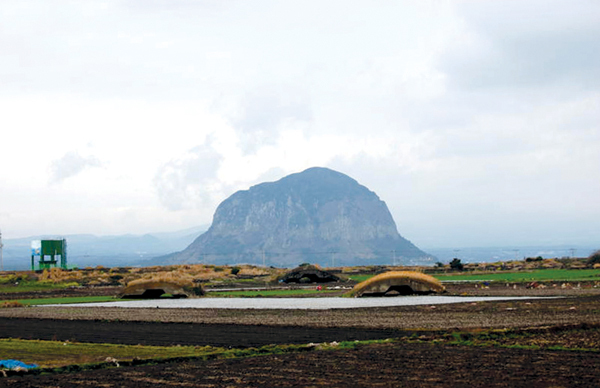 The area is a registered cultural site and the Jeju provincial government would like to convert it into a peace park. This would entail preservation of the hangars and surrounding military facilities, the construction of exhibition halls and a center for youth. According to Park such plans would cost 74. 8 billion won. Presently there is no start date for construction due to the fact that “in order to go ahead with the plan it requires the transfer of ownership of the airfield from the Ministry of Defense to the Jeju government,” said Kim Jay Yoon, a Seogwipo lawmaker who put forth the peace park notion to the Jeju government in Nov. 2009.